Vijay Sethupathi is now a true blue 'mass Kollywood hero' with Karuppan. The film is a template rural mass entertainer that Tamil cinema has been dishing out since the '80s. Rajinikanth and Kamal Haasan used to do such films in the '80s, that extended their reach to the B and C markets, and later, Vijay and Ajith followed suit. Now, Vijay Sethupathi — a multiplex audience favourite, and known for his performance-oriented roles — is on the cusp of superstardom. His advisors have told him that penetrating the crucial B and C market will be key to capturing a larger fan base. Karuppan is Vijay Sethupathi's earnest attempt to woo the all-important mass market. Director Panneerselvam has etched Karuppan out of many earlier rural milieu films, including Karthi’s Komban. The story is as old as the hills, and there is nothing new in its presentation or style. 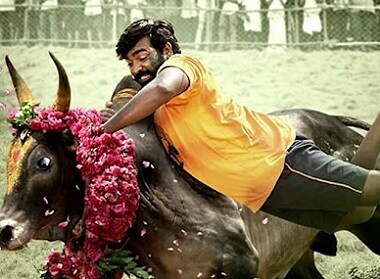 Karuppan (Vijay Sethupathi) is a bull fighter (Jalikkattu exponent) in a village, a rough and tough guy who has a drinking problem. At the time of a Jallikattu, Maayi (Pasupathy) a local chieftain, agrees to marry his sister Anbu (Tanya Ravichandran) to Karuppan if he manages to tame his ferocious bull. Soon Karuppan marries Anbu much against the wishes of Maayi’s brother-in-law Kathir (Bobby Simhaa) who has an eye on her. Kathir, through his machinations, creates problems in Karuppan's life, which forms the crux of the film. Vijay Sethupathi is the highlight of this predictable formulaic film, where he is given a terrific hero introduction scene. The scene in the bar when he is fully drunk along with his uncle (Singam Puli) and singing popular numbers from recent Tamil films is a scream. The romance between Vijay Sethupathi and Tanya is a delight, especially when he is drunk and makes a scene in front of her and goes back in the morning to apologise. And when he comes to know that she is pregnant and carrying twins, the expressions and joy on his face will make you laugh. The others in the supporting cast like Pasupathy as the heroine's brother and Bobby Simhaa as the soft-spoken villain have done their roles well. Tanya Ravichandran has done a good job as the heroine, but one wishes she had dubbed in her own voice. The comedy scenes of Singam Puli as the hero’s uncle have worked out. The bull fight scenes using CGI are impressive, especially the close-up shots of the hero taming the animal. The music of D Imman includes many hummable melodies, but their placement in the film slows down its pace. Sakthivel's camera captures the Dindigul village locales beautifully and VT Vijayan's editing is crisp. The first half is decent, but the second half moves at snail's pace, with a seemingly forced ending as the screenplay meanders. On the whole, Karuppan is Vijay Sethupathi’s first attempt at doing a rural mass entertainer, and will be liked only by a section of the audiences.